Ah, summer. It’s here or right around the corner. If you’re like me, then pulling out the grill is an integral part of the summer season. I’ve always been someone who prefers a gas grill. If you fall into the same category, here are some tips to make sure you’re ready for grilling season. The hose that carries the gas to the grill needs to be checked every year. The hoses can crack, the fittings could come loose or crack themselves. It’s important to make sure that you don’t have a leak. Inspect the hoses for cracks. To test the connections, use soapy water. Put the soapy water over the connections and turn on the gas. If any bubbles form, you have a leak. If this happens, you need to replace your supply lines. The grill box needs to be checked for any cracks. If you find any, chances are it’s going to be time to replace the grill, or try to salvage a replacement box. Flakes of grilling sessions past will accumulate on the bottom of the box. While many of these will burn off over time, it’s a good idea to clean the debris every so often. A shop vac is a great tool for this task. properly. One year, we had a spider build a nest inside one, and the line did not function properly. If they need attention, refer to your instruction manual on how to disassemble the line for cleaning. We take off the grates and clean them. This will remove grease and give it a fresh start to the season. You can usually use a grill brush to keep them clear in between grilling sessions. Depending on how often you grill, you may need to clean these monthly. If you have a dedicated gas line, this may not apply to you. But, we use propane and have 20-gallon tanks. Check your supply at the beginning of the season. We have two tanks, and try to keep one full at all times. 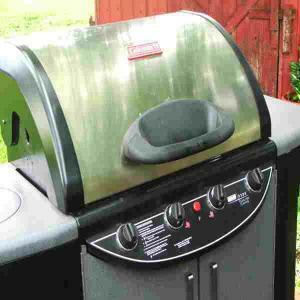 This ensures that you won’t run out of gas halfway through grilling up your favorite recipe. Grilling involves a lot more than the grill. Make sure you have your full inventory of flippers, thermometers, brushes, basters and such at the ready. Look them over and make sure they’re all ready to go. The last thing you want to do is step away from your meat to have to find a needed accessory. Nothing beats something fresh off the grill. With a few minutes of easy work, you can make sure that you have a summer full of great grilling ahead. Readers, have you used the grill yet? What are your tips for a great grilling season? Share your thoughts and ideas in the comments below. Happy grilling! Will Stride Rite Be Around Much Longer? We’re looking forward to grilling on our patio this summer, but first we have to get a grill! Our first choice is getting a gas grill, but we don’t have a gas line going to the patio. That may be a future upgrade.